Four of the 13 institutions recently honored with the Online Learning Consortium’s 2018 Digital Learning Innovation Awards used Realizeit’s intelligent adaptive learning platform to power their winning projects. The awards recognize higher education leaders for improving student success through the adoption of digital learning technology. The University of Central Florida was one of three institution-led teams awarded $100,000 prizes, while faculty-led teams at Georgia State University, Portland State University and The American Women’s College at Bay Path University were among the 10 honorees awarded $10,000 prizes. At UCF, math instructors redesigned two Intermediate Algebra and College Algebra courses to better serve the university’s targeted student population, which includes a significant number of transfer, Pell-eligible, and underserved students. The adaptive math courses, created in collaboration with UCF instructional designers and their adaptive learning providers, have led to improved student success, increased learning, and enhanced engagement. In College Algebra, success rates have increased by 15% compared to semesters prior to adoption, compared with online, non-adaptive sections. At Portland State, Senior Instructor and Course Coordinator Rachel Webb and her team combined original OER materials and adaptive learning to take a new approach to introductory statistics. The team’s goal was to decrease costs and increase passing and retention rates while providing a more dynamic and standardized mode of content delivery. Faculty also use the adaptive platform’s analytics to catch at-risk students early and help them succeed. In PSU’s first session using the adaptive course, students’ final exam grades were 12% higher on average despite the course’s foundational content and exams remaining the same. 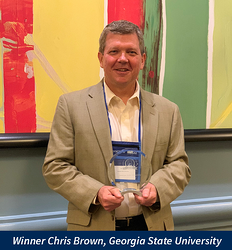 GSU senior lecturers Dr. Chris Brown and Dr. Jeannie Grussendorf created their adaptive political science course to address the challenges common to managing core, high-enrollment courses, among them the different levels of incoming knowledge and lack of preparation among students. After piloting with 1,200+ students in fall 2017 and seeing DFW rates decrease nearly 20%, they conducted a control study the following spring, with DFW rates again lower in adaptive courses (19.1% versus 21.4%). Across 36 common test questions given to all sections (700+ students) in the spring, adaptive sections did significantly better than non-adaptive sections. Capitalizing on a centralized course management model whereby each course section utilizes the same content, consistent outcomes, and business rules to support students, The American Women’s College (TAWC) at Bay Path University successfully scaled adaptive learning via OER adoptions. Over the past two academic years, TAWC used this approach to develop and/or redesign 51 courses to enhance student learning and lower costs. Overall, via TAWC’s automated outreach plans and alert rules, as well as by selective course redesigns identified via data from its adaptive platform, TAWC’s approach has yielded rates for retention (75%), course completion (93%), and student satisfaction (95%) that surpass national averages in the non-traditional, online space. Learn more about the program, winners and review process from OLC.